The first time I saw Green Day live was at least thirteen years ago at a tiny club in Phoenix, Arizona called the Mason Jar. I prolly listened to a cassette of 39 Smooth a thousand times before that show. I was somewhat less prepared for them this time around. I'd heard the new record, American Idiot, quite a bit in the office and while I admired both the political and rock opera goals the band had set for themselves, I wasn't sure if they'd evolved as far as they'd set out to. Then my friend and co-worker, Joe, invited me to go with him to their show at the Rose Garden. I'd seen Green Day quite a bit in small venues so I wasn't sure if I really needed to see them in a big arena venue. I was less sure after we arrived and searched for seats. The show was all general admission, despite there being seats for everything but the floor. It was a weird setup and one that forced Joe and I up to the upper seating area. The place was dirty with kids. The under-20 set was out in force and ready for a good time. I never know what to expect from a Portland audience. Sometimes they're super into it and sometime they're way too cool for their own good. And while the general admission setup irritated me a bit at first, it was exactly what these kids needed. They were primed and ready for this and from the "American Idiot" opening through to the obvious, yet perfect ender of "Time of Your Life" Green Day obliged them, playing with more energy, enthusiasm, and contagious excitement than their decade-younger selves could have possibly imagined. Every song, hell every chord felt like it had been plucked from rock heaven especially for this union between band and audience. New material, sprinkled with songs from every period of their career seemlessly flowing back and forth from four-piece pop to three-piece punk and keeping the crowd coasting on each wave and break. During their cover of Operation Ivy's "Knowledge," Billy Joe went to the audience and picked "a new band." A drummer, a bass player, and a would-be guitar god all picked from the people on the floor jammed through the last verse and a rollicking final chorus cementing an enduring connection between performer and concert-goer. It's a bit that you just know that they do every night, but it doesn't matter. It felt perfect--just for us and more intimate than the tiniest club I'd ever seen them in. Billy Joe was funny and personable and passionate--a viable heir to the dearly departed king of political punk, The Clash's Joe Strummer. And the production was equally amazing. Light shows, pyrotechnics, flags, banners, and confetti-firing cannons. This was a 70s era rock show for a modern audience. A presentation that would make Kiss proud and Weezer jealous. Anything more I could say on that mark wouldn't possibly do the spectacle justice. Sometimes when you're "growing old," you just feel the "old" and forget what fun the "growing" can be. 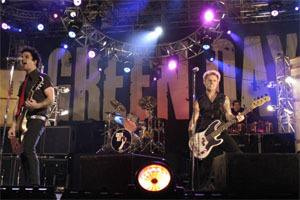 Green Day is a band whose growth may not be obvious on the surface but who've still transformed into something greater. They've avoided the tired aches that often plague a punk trio after being together for this long and instead have stretched in unexpected directions, growing into a truly great rock 'n' roll band.